GET READY TO ROCK MELBOURNE as Australia’s leading Queen Tribute Show – QUEEN FOREVER – are performing at The Corner Hotel on Saturday November 11th. The essence of Queen is captured perfectly with incredible costumes, a stunning portrayal of Freddie Mercury by Gareth Hill and a stage show that will blow you away. You’ll hear all the biggest Queen hits including We Will Rock You, We Are The Champions, Another One Bites The Dust, Fat Bottomed Girls, Don’t Stop Me Now, Crazy Little Thing Called Love, Somebody to Love and of course, Bohemian Rhapsody. This is a show not to miss. 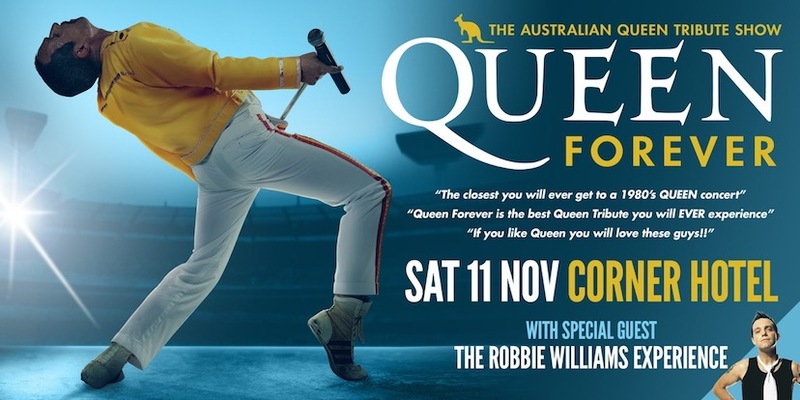 The World’s No 1 Robbie Williams Tribute stars one of Melbourne’s most popular entertainers Louie Lee Feltrin – playing all of Robbie’s greatest hits such as ROCK DJ, FEEL, LET ME ENTERTAIN YOU, ANGELS and many more. QUEEN FOREVER with SPECIAL GUEST THE ROBBIE WILLIAMS EXPERIENCE – WHAT A NIGHT! DON’T MISS IT!